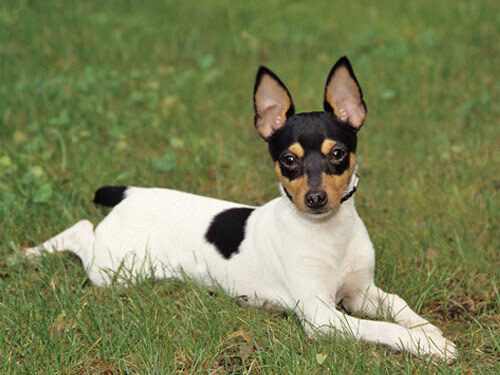 A descendant of the Smooth Fox Terrier, the Toy Fox Terrier was developed in the United States during the 1930s. They were most commonly used as ratters and circus performers. Commonly referred to as the Amertoy, this breed was admitted into the American Kennel Club Toy Group division in 2003. The Toy Fox Terrier is small, agile, sturdy, and energetic. This breed is considered to be more responsive and more trainable than most terriers. They are extremely alert, hardy, and playful. They have a fearless nature and are not easily intimidated. A sensitive, loving, loyal, and affectionate breed, the Toy Fox Terrier is a spirited companion. Due to their stature they do best in a home with older considerate children. They thrive on attention and stimulation. This breed will get along with dogs, cats, and other household pets they have been raised with. They may have a tendency to display aggression to same gender dogs and will fight if provoked or threatened. The Toy Fox Terrier is exceedingly animated, comical, fun loving, and entertaining. Toy Fox Terriers are relatively maintenance free. An occasional brushing will suffice. Bathe or dry shampoo when necessary. It is important to provide regular dental hygiene. The nails must be kept short. The Toy Fox Terrier is prone to such health issues as allergies to beet, corn, and wheat, demodectic mange, patella luxation, Legg-Calve-Perthe disease, Von Willebrands disease, and congenital hypothyroidism with goiter. They do not do well in cold climates. The coat of the Toy Fox Terrier is smooth to the touch, shiny, and fine in texture. It is of uniform length on the body and slightly longer in the ruff. The color of the coat is tri-color black, tan, and white. Other colors include white, chocolate, and tan, white and tan, or black and white. This breed is a light shedder. A highly intelligent breed, the Toy Fox Terrier is quick to learn. Early socialization and obedience are recommended. They will not respond to harsh or heavy-handed methods. Training should be done with fairness, praise, firmness, reward, and consistency. This breed is exceptionally talented as a hearing dog for the deaf and as an assistant to the handicapped. The Toy Fox Terrier benefits from regular daily exercise. They enjoy securely leashed walks, family play sessions, and a safely fenced area to run and romp in freely. They will do well in an apartment or condominium dwelling provided they are given sufficient exercise, attention, and stimulation.